Of all the countries in the world currently undergoing serious unrest, Venezuela’s problems look the easiest to resolve. It’s just economics. Broadly speaking, Ukraine’s rupture is ethnic, Thailand’s regional and Syria’s religious. By contrast, Venezuela is ethnically and religiously united. It even has oil wealth. But high inequality and growing chaos bedevil the Latin American nation – problems that can be alleviated even without wrenching political upheaval. In Syria, unrest turned into a religious civil war with six-figure casualties. In Ukraine, a division between Russophile East and Europhile West descended into violence, with scores killed before ousted leader Viktor Yanukovich fled. In Thailand, the metropolitan and southern regions have consistently refused to accept democratic election victories by a populist northern-backed party. However in Venezuela such ethnic, regional or religious divisions are not the cause of riots in the streets. They derive primarily from the failure of President Nicolas Maduro’s economic policies. Venezuela has a huge source of foreign exchange income in its oil deposits, but mismanagement and politicization of the state oil giant PDVSA, together with diversion of its funds to government projects and subsidies, have caused production to decline by around a quarter since 2001, according to the U.S. Energy Information Administration. However Venezuela’s worst economic problem derives from government meddling with price mechanisms. Domestic gasoline prices held below 10 cents per gallon drain PDVSA’s resources and encourage wasteful consumption. Caracas created yet another two-tier foreign exchange mechanism last week, so that the black market rate is now some 87 bolivars to the dollar, compared with the official rate of no more than 11. Prices are artificially held down by decree, even as reported inflation surges above 50 percent. While the protesters’ demand for Maduro’s resignation must be non-negotiable, the president could usefully observe the actions of Argentina’s government when faced with similar difficulties. By relaxing government control of currency markets and revising the consumer price index to reflect reality more closely, President Cristina Fernandez dampened protests, at least for now. By moving to a free-market exchange rate, freeing prices, reducing the gasoline subsidy and allowing technocrats into PDVSA management, Maduro could greatly improve Venezuela’s economic position without slackening his hold on power. That wouldn’t satisfy the opposition, but it might lessen support for the protesters. 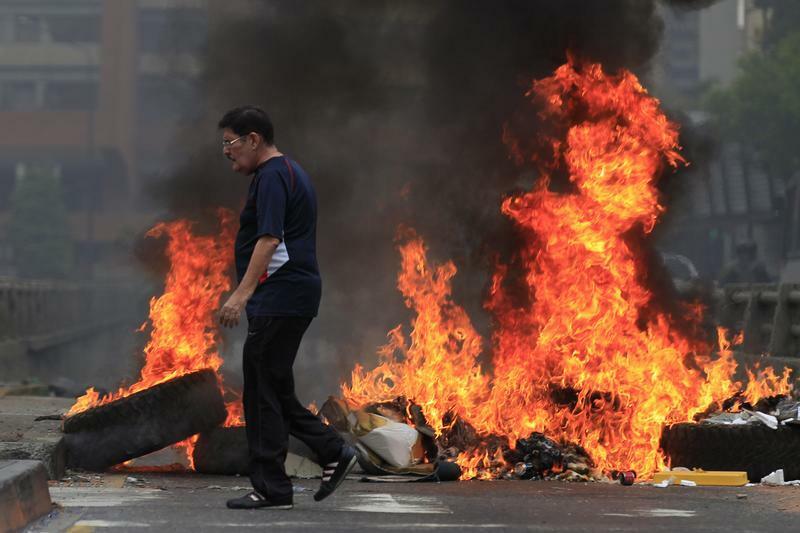 The Venezuelan opposition hopes that the government will fall, as it did in Ukraine. But Maduro can save himself by economic means. At least 13 people have been killed in the recent violence in Venezuela, while an opposition leader, Leopoldo Lopez, has been arrested. Venezuelan President Nicolas Maduro on Feb. 19 signed a decree creating a new foreign exchange system, “Sicad 2,” which would enlarge the existing two-tier system.